We are crying. Because Harry Potter brings back so many memories and a reunion would simply make us... sniff... weep. 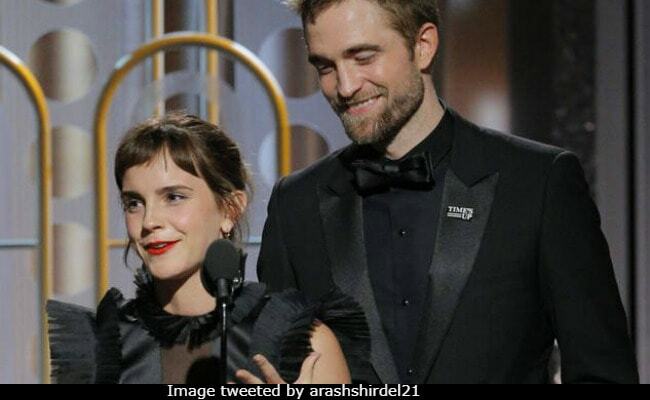 All Harry Potter nerds from all houses of Hogwarts voted Emma Watson and Robert Pattison's appearance on the Golden Globes stage as one of the highlights of the awards gala and... sniff... we cannot NOT agree, right? Robert Pattinson played Cedric Diggory of house Hufflepuff in the Harry Potter series of films while one third of the protagonist trifecta - Hermione Granger was portrayed by Emma Watson. "I just wanna thank the Golden Globes for blessing us with a harry potter reunion. (Cedric Diggory is alive and well!)" read a tweet while another added: "Emma Watson and Robert Pattinson presenting together is the Harry Potter reunion I needed." Cedric Diggory, one of the brightest students of Hogwarts, died in the fourth movie of the series - Harry Potter And The Goblet Of Fire - the film released in 2005. Hermione was last seen in Harry Potter And The Deathly Hallows - Part 2 (the last film in the series), which hit screens in 2011. At the Golden Globes, Hermione Granger and Cedric Diggory presented the Best Limited Series or TV Film award, which was swept up by TV show Big Little Lies. Enjoy Harry Potter feels here with a mug of foaming butterbeer please. If that was not all, true blue Harry Potter fans also spotted David Thewlis (Professor Lupin) in the audience and wished he would call the Order Of The Phoenix for a meet, especially with Golden Globe-winner Gary Oldman also present. Gary Oldman, who played Sirius Black in the Harry Potter films, won Best Actor - drama - for Darkest Hour. "So since Gary Oldman, David Thewlis and Emma Watson are all at the Golden Globes I need like a million pictures of them together," read a tweet. We want to see them too! So since Gary Oldman, David Thewlis and Emma Watson are all at the #GoldenGlobes I need like a million pictures of them together. The 75th Golden Globes closed with Big Little Lies and Three Billboards Outside Ebbing, Missouri as the big winners of the night - both Big Little Lies and Three Billboards Outside Ebbing, Missouri won in four categories each.